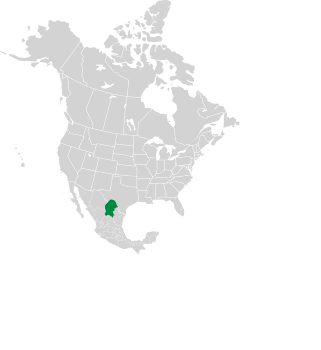 Cabbage head agave is found only in Coahulio, Mexico, and it is surprisingly cold tolerant (as low as 10-15°F), because in its native area it grows between elevations of 4500-8000' (1.4-2.4 km). Identification: The small, symmetrical blue-gray balls are 30-36" (76-91 cm) in diameter. Leaves are short, wide, nearly round, with spines along the edges. The leaves are textured with patterns and color variations that look like impressions from nearby leaves. 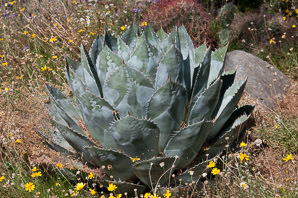 Not to be outdone by its much larger relatives, this agave produces a flower spike 9½-13' (3-4 m) high, split into 12-15 branches at the top; the open flowers are yellow, tinged with red or purple. The tall stalk, a little like a giant sprig of asparagus, is similar to the century plant, but the century plant has long sharp-edged leaves. 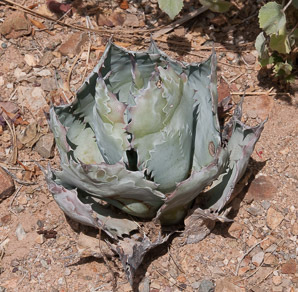 It looks similar to Agave parryi, another cold-hardy species that resembles a cabbage. Wikipedia explains that Agave parryi has darker points on each leaf tip (dark tan, brown, or black), and that the indentations of previous leaves show on the back of each leaf. 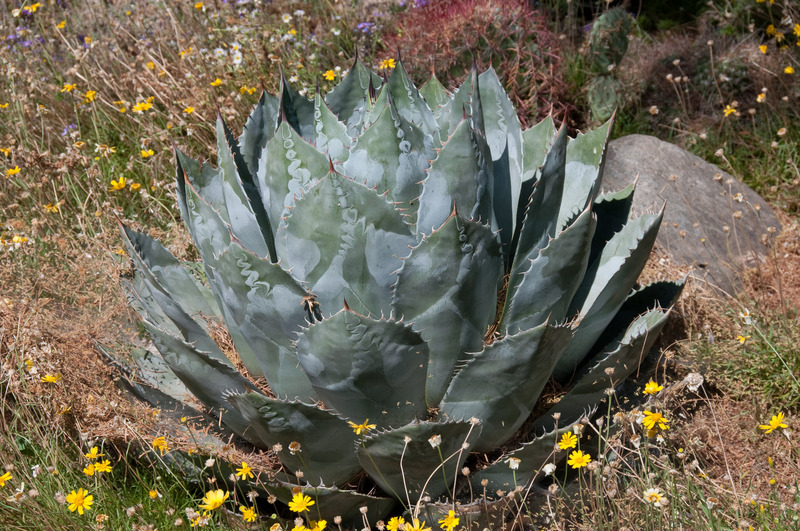 Agave parrasana description by Thomas H. Kent, last updated 12 Oct 2018.